Restore and protect your plastics, rubber and leather with ease! 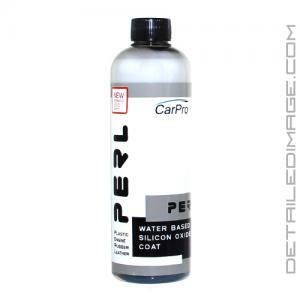 CarPro PERL is a water-based coating that will protect your plastics, rubber and leather with ease! PERL restores the like-new appearance of these surfaces and keeps them looking good with strong UV and hydrophobic protection. This protective coating will last up to three months and it can be used on external plastics, engine bay, tires and rubber, interior vinyl and leather, etc! PERL is also water-based and contains no solvents. This allows this coating to dry onto the surface without damaging tires or drying out plastics. You will just be left with a non greasy, beautiful satin shine! When applied to leather, it will stop cracking and protect from future dirt and stains. PERL is concentrated and we recommend diluting it with water according to the instructions below. Protect and restore your plastic, rubber, and leather pieces with CarPro PERL today! Tires & Rubber: Undiluted 1:1 (Recommended 1:1) 2 thin coats with 20 minutes or more between will offer the amazing looking tires. If you're looking for a great "bang for your buck" product that can tackle many tasks...CarPro PERL is a fantastic choice. Restore & create satin shine finish. Non greasy - Solvent free. High durability up to 3 months. Clean the surface from dirt, oil & dust. Pour into sprayer bottle and shake. Wipe off with MF. Tires/rubber can be applied with sponge applicator. This was actually my first time using this product and I can honestly say that it will officially be part of my "Go-to arsenal" The product does great on so many different surfaces and you can either get a shiny finish or a nice clean matte finish depending on how much you dilute it. Another plus is that it give recommend dilution ratios on the label. If you haven't tried this yet, do yourself a favor and grab a bottle or two. You won't be disappointed. I LOVE this product, I'm addicted to it. On the wheels at full strength is amazing and does not sling off. Snow and water... still there. Put it in a squeeze bottle to avoid wasting it. This stuff is a detailers secret because it's such a great product for application, protection and a lasting shine which proves its durability.